The pendant of custom PVC rubber keychain is mainly composed of a key ring and rubber adornment. As a professional rubber keychain supplier in China, we not only offer rubber keychain, but also customize its shapes and colors. You can send your logo and let us design your customized PVC keychain. Some of our PVC rubber keychain pattern is stereo, it will make the keychain looks more high-quality and beautiful. The PVC rubber key rings also has many advantages, such as waterproof, wearable, has standard color and long service life, etc. PVC rubber keychain can be used outdoors for a long time and won’t be destroyed. 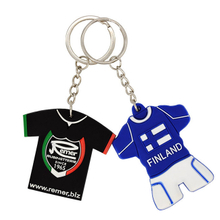 If you want a keychain which has decoration function, our PVC rubber keychain is the best choice for you. We guarantee the quality of PVC rubber keychain, just select the pattern you want.